In the spring, the Graphic History Collective re-launched Remember / Resist / Redraw: A Radical History Poster Project as an ongoing series. 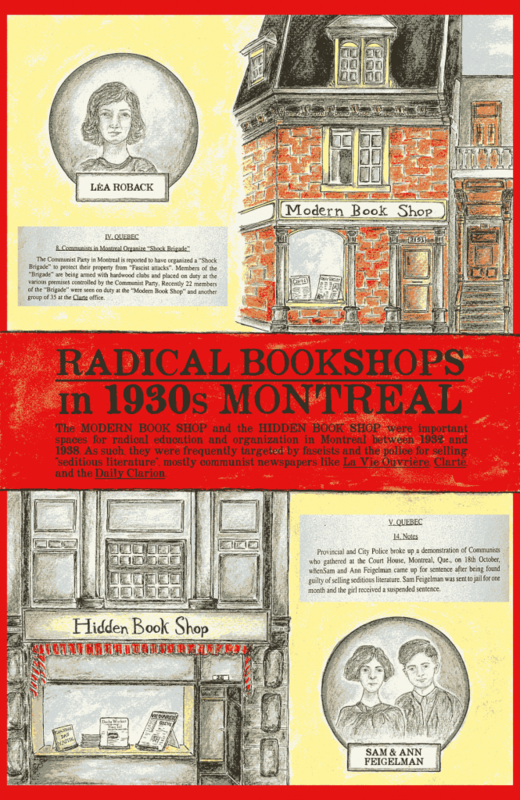 Earlier this week, we released RRR poster #16 by Adèle Clapperton-Richard and Andrée Lévesque, a bilingual poster that looks at radical bookshops in 1930s Montréal as important spaces of activist education and organizing. We also created a list of radical bookshops (included at the bottom of this post) in operation today in what is currently Canada, and we are encouraging people to seek them out this summer. Many radical bookshops have excellent history sections, accenting people’s history and histories of the marginalized and dispossessed that you won’t find at corporate bookstores. So, instead of (or maybe in addition to??) completing the #InMyFeelingsChallenge this summer, we are challenging you to check out your local radical bookshop. We hope that Remember | Resist | Redraw encourages people to critically examine history in ways that can fuel our radical imaginations and support struggles for social change. Learn more about how you can support the project on our website, and connect with us on Facebook, Twitter, and Instagram. There are many great radical bookshops in operation today in what is currently Canada. Below are some of our favorites. Please pay them a visit. Toronto, “Dish With One Spoon Territory.” The Dish With One Spoon is a treaty between the Anishinaabe, Mississaugas and Haudenosaunee that bound them to share the territory and protect the land.